Quilting and Sewing with Kids: Perfect Sewing Machine for Kids? Perfect Sewing Machine for Kids? I'm on a quest. I want to find the perfect sewing machine for kids. And I want a REAL machine - not one of those silly kiddie machines that are so cute but useless. I have a couple of granddaughters who are both turning 10 in a few months and I decided I'd like to start a tradition of gifting sewing machines at that age. What about the grandsons? Well, I'll have to think on that one. Should they show an interest in sewing, it might be a good gift for them, as well. But at this point, I don't have any with a 10th birthday coming up so will revisit the idea when necessary. Now, back to the perfect sewing machine . . . The perfect sewing machine for a child has to be simple and durable. At the top of my list is a drop in bobbin. I didn't appreciate how important this feature is until I had to deal with the other kind. I've been sewing since I was small and always had a machine with a drop in bobbin. Even as an adult, correctly inserting the bobbin into the little do-funny and then trying to maneuver the thing into the correct position at an awkward angle is more than I can handle. Sewing should be fun! So why make it difficult? Anyway, the drop in bobbin is a non-negotiable. Other desirable features include zigzag, convenient reverse and easy threading. To this end, an automatic needle threader would also be nice but not essential - after all, young eyes can see the eye in the needle. In fact, I can still thread a needle manually when I have to and it may actually be good for enhanced eye-hand coordination. So an easy thread path, but not necessarily a needle threader, is in order. On the reverse, I like to sew backwards at the start and end of each seam so want reverse to be easy to get to. Durability is a no brainer - this is for a child. Gone are the days of bullet-proof machines as the standard. So why don't I just get vintage machines? Been there, done that and they're just too heavy and temperamental for my purposes. I actually gave one of the granddaughters a 1947 Singer in a cabinet but it has proved cumbersome and difficult for her to operate on her own. In fact, she is the reason for this quest - she'll be 10 in March and I want her to have a machine she can use at will without needing assistance. 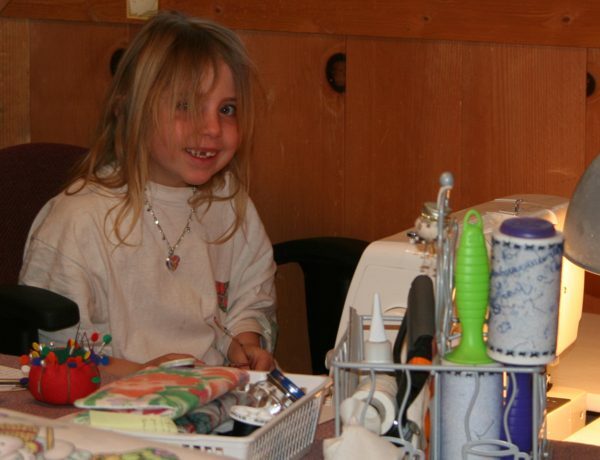 Should Kids Have Their Own Sewing Machine? I say absolutely! My daughter had a sewing machine of her own in her room from about age 8 or so. She also had her own fabric stash and sewing supplies and could sew whenever she wanted. Not only is sewing a wholesome activity, it's also a practical skill that too few children learn these days. In addition, having the freedom to create with fabric (and make and correct mistakes) provides valuable experience in math, measuring and other areas. Have I convinced you yet? So Which Machine is Best? I've just begun my preliminary research so don't have an answer yet. I'm partial to Singer but am not sold on it as the best option at this point. I've looked at the basic models in the store and read through reviews online and there seems to be quite a bit of dissatisfaction with the reverse lever and durability. I wasn't able to actually test drive any of the models while at the store but will do so once I've narrowed down my choices. At any rate, I'm just starting this quest so am open to suggestions. I'd like to keep the price to $100 or less. Anyway, if you have an opinion on this subject, please chime in - I need all the help I can get! Hope this helps! Both the refurbished machines I received were brand new and in perfect working order! Thanks for the info! I had the Janome Jem recommended by email and will be checking it out, as well. But $60 with free shipping for new customers at Overstock will be hard to beat.